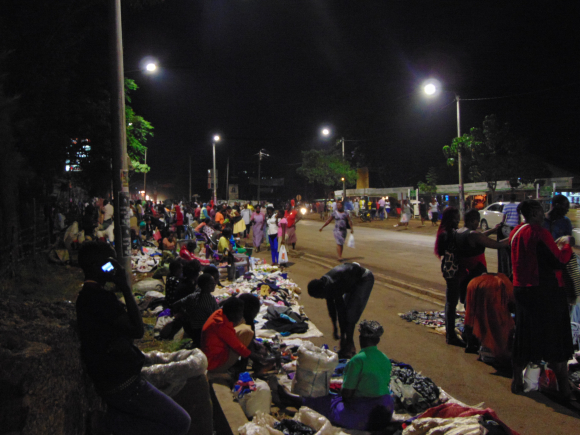 This paper is about the contested use of urban space, focusing on the appropriation of informal trading spaces by street traders in Kisumu, Kenya’s third largest city. The objective is to understand the access to and control of the trading streets around Jomo Kenyatta Sports Ground. These trading places are understood as a resource. I argue that legal and political contradictions create an ambiguous institutional environment. These ambiguities contribute to the development of conflicts in the use of these trading places and give advantages to actors with a key position, particularly the brokers acting as an interface between street traders and authorities. The empirical material for this study comes from surveys carried out in Kisumu between April and December 2016. 26 semi-structured interviews, three life story interviews and two focus group interviews were carried out, mainly with street traders. The first part of this paper develops the theoretical approach and the ambiguity of the street trading institutional environment. The second part deals with the daily struggle for trading places and then it focuses on projects by local authorities about street trade management. These projects increase the process of fragmentation of street traders’ associations. The names of those interviewed have been changed. This research is a fringe activity of the “Urbanization and Street Vending” project, which I coordinated at the French Institute of Research in Africa (IFRA-Nairobi). The project organised two forums (Kisumu and Nairobi) and a scientific conference in Nairobi in 2016, http://ifra-nairobi.net/1099). I wish to express my gratitude to the street traders in Kisumu (particularly Godfrey and Rasta), to the two anonymous reviewers, to the editor for this themed issue, Sabine Dörry, and to Richard Dickinson, Jackson Kago and David Scott for the English editing. 1There have never been so many shopping malls in Kenya as today. Yet, this has not led to a decline in the so-called “informal” street trading. Is this a paradox? It certainly is a paradox according to the modernist political vision and according to the model of urbanism, which aims to formalise economic activities, particularly by restricting trading to private, closed spaces. However, when walking around the streets of Nairobi, that is, the country’s metropolis and showcase for modernity, or the streets of Kisumu, Kenya’s third-largest city, clearly street traders are part of the urban landscape. In and around the Central Business Districts (CBDs) of these cities, trade exists in the public space often viewed as informal particularly by the authorities. This form of trade is both sedentary and mobile; it coexists through more or less conflictual relations with supermarkets, banks and administrative authorities. Street traders are the visible face of the informal sector, which is the very backbone of Kenya’s economy and employment. In Sub-Saharan Africa, the informal sector is growing (Roever and Skinner 2016, Skinner 2008, Verik 2006) and represents 72% of non-agricultural jobs, which represents from 50 to 80% of the GDP and which accounts for 90% of job creation (Benjamin et al. 2014). Kenya drives the local/regional economy in this part of Africa with an annual growth of over 5%, although half the population still lives below the poverty line. The 2017 national economic study shows that jobs in the informal sector (except small-scale agriculture and livestock farming) increased by 5.9% between 2015 and 2016. This number represents 89.7% of all jobs created during this period and 60% of those created in trade and the food service industry (Kenya National Bureau of Statistics 2017). Kisumu had 404,000 inhabitants in 2009 (Kenya National Bureau of Statistics 2015) and its reputation of being a poor, rebellious city is still considered the result of its political and economic marginalization since Kenya gained its Independence from Great Britain in 1963 (Bourmaud 1988). In the recent past, the 2007/2008 post-election violence was very intense in Kisumu with massive destruction of parts of the downtown areas. Among the many consequences, it strongly affected the local economic environment (Mercurol 2017). Kisumu’s informal sector represents 61% of jobs (Kenya National Bureau of Statistics 2015), and observers agree that the number of street traders is continually increasing (Onyango et al. 2012). Today, street trading is omnipresent in this century-old city. 2Despite street trading being an economically and socially self-evident fact, the relations between the authorities and street traders generally involve conflicts, which are violent at times. The local authorities use by-laws from the colonial era to deter private traders from access to the public space. Conversely, the street traders refer to national laws (acts) and to the recent Constitution to support their claims to trade in the street. These legal contradictions are tangled up with political contradictions. At the national level, the informal sector and small-scale enterprises are recognized and presented as sectors, which should be supported, as indicated in the Kenya Vision 2030 national development plan (Government of the Republic of Kenya 2007). However, at the local scale, street traders work in a hostile environment, with regular forced evictions being the most visible example of that hostility. 3This paper examines the contested use of space and focusses on the appropriation of informal trading spaces by street traders in Kisumu. In so doing, the focus was on the streets around Jomo Kenyatta Sports Ground (map 1) because they have been occupied mainly as a result of public policies such as the renovation of the bus park in 2003 and the eviction of the Oile market in 2014. Moreover, in contrast with the walkways in commercial streets, which have been occupied since the 1970s, spaces around the park were free in the early 2000s. Informal traders view streets as a strategic space for their economic development by offering a continuous flow of potential customers (Steck 2006). Space – in this case the streets for precarious sellers – remains a resource in itself and the object of strategies, struggles and, sometimes, violent conflict. The daily appropriation and regulation of trading streets illustrate the conflicts in a space, which “always provokes argument and becomes of prime importance in struggles and actions aimed at an objective” (Lefebvre 1974: 471). My objective is to understand the access and the control of that resource by looking at the relationships between the actors, particularly the street traders around Jomo Kenyatta Sports Ground and the authorities. I argue that the legal and political contradictions mentioned above create an ambiguous institutional environment. Such ambiguities contribute to the development of conflicts about the appropriation and regulation of trading streets and give advantages to actors in key positions, particularly to those who act as mediators between street traders and authorities. In other words, the intention is to look at the power rivalries centred on the access to and control of the sought-after space – Kisumu’s informal trading streets. The empirical material for this study comes from surveys carried out in Kisumu between April and December 2016. 26 semi-structured interviews, three life story interviews and two focus group interviews were carried out mainly with street traders. The structure of this paper is as follows. The first part develops the theoretical approach, which addresses the ambiguity of the current institutional environment. The second part scrutinises the daily struggle for trading places and then it examines the rise in competition consequential to public projects about street trading. The paper finishes by concluding that the governance of contested spaces and public policies are characterised by inclusion and exclusion processes. The ambiguities of the governance are a political construction such as the status of “informal”. The collective governance of informal street trading results in the fragmentation of the street trading class. 4The topic of street trading is part of the debate on the informal economy. The concept of the informal economy dates back to the work of Keith Hart in the early 1970s about income generation of poor households in Ghana (Hart 1973). At the same period, the ILO report (1972) on the urban households in Nairobi defined the informal sector concerning the characteristics of the enterprises and the low level of market regulation. Since the 1970s, in the Global South, the informal economy has increased and is the norm of employment (Charmes 2012, Chen et al. 2016). The growth of the informal sector is perceived as a social, economic and political response to the economic crisis and to the liberalisation of the economy in advanced and less developed countries (Portes et al. 1989). In the 2000s, attention was paid to the relation between actors, organisations and institutions in this sector (Berrou 2014). The consensus definition of the term “informal” is that of economic activities which operate outside all state regulations (Portes et al. 1989) but the boundary between the informal and the formal is, however, not clear as the two sectors interconnect in multiple ways (Lindell 2010). For instance, in Kenya, “the Somali shopping-centre model is successful because it gives informality a room” (Scharrer and Carrier 2017: 36); here, trade combines elements of both formality and informality, as formal shopkeepers can give goods to hawkers on credit. This means that specific rules, institutions and actors regulate the informal sector. Regulation makes sense in specific contexts and notably in the case of state regulation (Lindell 2010, Meagher 2010) which uses the term “informality” as a category of practices. For example, “informality” enables the authorities to legitimise repressive practices (Potts 2008). Otherwise, street traders recognise themselves as informal traders mainly because of the lack of state recognition and therefore can have a collective political voice with collective action (Brown and Lyons 2010) although the “urban informal economy has often become a sphere of intense political competition” (Lindell 2010: 3). 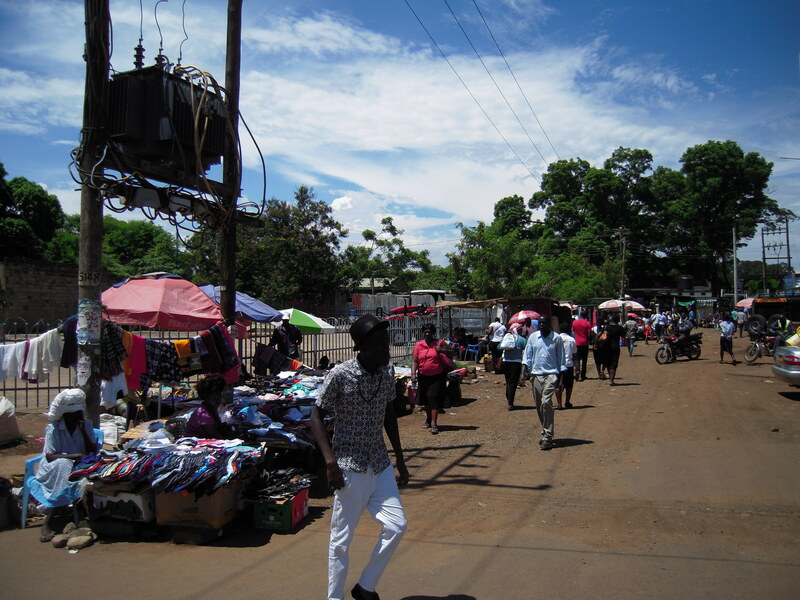 These different dimensions of informality, that is, blurred boundaries, specific regulations, the category of practices, connections with politics, collective organization, political competition and conflict, among others, enable the strategies of the actors for the access to and control of Kisumu’s informal trading streets to be deciphered. 5The analysis of the competition for street trading spaces is inspired by Lacoste’s work on geopolitics (2012), which states that it is important to analyse “power rivalries for territories” by considering the different spatial scales, key players, power relations and representations. Raffestin (1980) suggests that territorial production itself can thus be interpreted as a projection of the sphere of power over a given space (see also Redon et al. 2015). Power is conceived of as a flow or, in other words, an inherent communication process. Power relations are consubstantial with the processes of appropriation of a sought-after resource like a street trading place. Traders, that are private actors, aim to appropriate parts of the public space – street grabbing (Racaud 2015) – to trade and make revenue, whereas the authorities consider the control of the public space to be a symbol of power and legitimisation. Opportunities appear between these two stances depending on the different agents’ position. For example, a leader of street traders, who cooperates with the city authorities in the resettlement process of traders, is directly involved in the negotiation and is therefore able to benefit from his position by receiving a few shops from actors implementing the project. This would ensure long-term cooperation of group members through clientelism. Hence, the local power arena is a loose conglomeration of many actors from several sectors (public/private, economic/politic, government/civil society, formal/informal), but this arena’s frontiers are permeable (Blundo 2002). 6Further, the streets are the object of representations and demands. As expressed in French with the terminology espace-ressource (Martignon 2003, Retaillé 2011), streets are not just a space-framework for activities. Rather they themselves become a resource because like any resource, they are a “reality entering into a production process” (Levy and Lussault 2003: 798). Streets, grasped as a resource are part of production processes, that is, of livelihood, of political legitimacy, of value, of the city, etc. Streets, understood as a resource, are the result of relations between actors, practices and a substance (Raffestin 1980), the latter is “space” in the case of “street”. Informal trading streets are spaces with specific regulations, identities and spatial configurations; they have different status and values according to the different actors involved in the uses and the regulation of the streets. Looking at conflictual informal trading street as a resource enables us to observe the power rivalries that are consubstantial to the production processes of so-called informal trading streets. Space is important as a means, which enables people to exert their activities or even as an end in itself (Martin 2006) such is the case in the conflicting claims for the streets. Around Jomo Kenyatta Sports Ground, competition for accessing and controlling the informal trading streets occurs among street traders, and rivalries for the streets occur between street traders and local authorities. The vendors are in need of trading places in order to generate income; therefore, streets are by default a socioeconomic resource. The local authorities want “modern streets”, i.e., without relics of underdevelopment such as street trade. In such case, the streets are a visible showcase of their power. Like any resource, its value increases according to growth in demand and to its scarcity. The latter can result, in this case, from conflicts in usages (commercial space vs. circulation space), restrained access (for example, because of repressive police measures) or increased competition for space between members of the same category of stakeholders. A trading street, like an agricultural parcel or grazing land (emblematic causes of rural land conflicts), belongs to a whole other register – that of property with its own “set of rules for access, usage and control applied to land and renewable resources” (Lavigne Delville 2002: 2). Indeed, a resource responds to the “rules or norms [ ] derived from the rights [ ] of the authorities” (Lavigne Delville 2002: 2). The concept of the resource emphasizes the actors’ different strategies for the appropriation and regulation of informal trading streets in Kisumu. These streets have specific landscapes, which are presented in the next section. 7Street trade in Kisumu developed in the 1970s, beginning in Oginga Odinga Street, the city’s main street, which houses the clocktower and most of the shops. In 2016, the city manager estimated that there were over 10,000 hawkers, while Mike, an emblematic leader of street vendors put the figure at around 8,500 (interview on June 10, 2016). Whatever the precise figure, thousands of street traders characterise the landscape of the CBD (see map 1 and pictures 1-3). The development of street trading in Kisumu is characterised by two major events, first, the renovation of its Bus Park in the early 2000s, and, second, the eviction from the Oile market in 2014. The Bus Park used to be a very important place for petty trade although the commercial amenities were in a bad state, e.g. there was no asphalt. The renovated Bus Park opened in 2003 and could not accommodate as many traders as before. Therefore, hundreds of informal traders moved to the streets around Jomo Kenyatta Sports Ground, e.g. Jomo Kenyatta Road, Ojino Okew back Street. 8Oile market, in contrast, developed in the first half of the 1990s, when traders spontaneously set up stalls on a green space, which was ideally located on the edge of the CBD and close to the main bus station. At the time, municipal policy tolerated Oile market because traders going to Oile did not occupy the streets. Up to 2,000 vendors (Nodalis et al. 2013) – over 3,000 according to the market’s former managers – settled in this 6,000m² space. It therefore became a centre for the collection and redistribution of agricultural products from the hinterland and a distribution site for imported merchandise. It was a very attractive and popular market well known throughout the entire Lake Victoria basin and all the way to Mombasa. The Bus Park renovation and the Oile market eviction led, however, to the mass arrival of placeless selling traders in the CBD. This increased competition for access to a trading place in the streets and particularly for the best places around Jomo Kenyatta Sports Ground. Street congestion increased between the early 2000s and the mid-2010s, and not all the traders moving from Oile were able to find alternative trading places. High demand for selling places exceeded their availability around Jomo Kenyatta Sports Ground by far. “This highlights a case where the informal economy is a creation of the state, even if this is by default. Political choices led to it” (Lautier 2003: 211). There is a direct link between public policies, or the absence thereof, and the fate of the so-called “informal” markets and the presence of street traders. The daily evidence of such activities and their proximity with the authorities’ offices calls into question the fact that informal activity occurs outside state regulation. 9Street traders are mainly concentrated in six streets around Jomo Kenyatta Sports Ground (map 1). The centrality of this area and its proximity to administrative services make it particularly attractive for street traders because the area concentrates the most important flows of the working population. The central location of street trading next to government buildings, shops and supermarkets shows the coexistence and the uncertain tolerance that exists between the authorities and informal activities. This reflects the ambiguous nature of relations because, according to the urban regulations of Kisumu city, the intended vocation of most of these streets was not commercial. 10Kisumu’s CBD shopping area is made up of two malls, a dozen of small and medium-sized supermarkets, dozens of shops, one market and the informal trading streets. The Mega Plaza Mall opened in 1996 while the West End Shopping Mall opened in 2015. Jubilee market is Kisumu's oldest market and the only market located near the CBD (the other eight markets are located in the outlying neighbourhood). Jubilee has 2,000 traders (Onyango et al. 2012). 11A distinction should be made between the long-term street trading at Oginga Odinga Street and street trading around Jomo Kenyatta Sports Ground. The former involves much less traders than the latter. In Kisumu, most of the formal shops are located in Oginga Odinga Street. Many of the wholesale shops owned by the Indian community were turned into supermarkets in the 1990s and are still run by the same community (Omenya 2015). The development of local chapters of national organisations and the development of local associations led to an increase in the number of formal traders associations in the early 2000s. The Indian community is a minority that plays a significant role in the Kenyan economy and is economically relatively well off. It is very active in these associations, which try to assert its interests that promote exclusion of street traders, e.g. by “complaining about unfair competition from the informal sector that encroached on the shop/factory doorsteps” (Onyango and Obera 2015: 76). “Repressive actions towards the activities of informal operators (trade, transport, crafts) are commonly seen as the result of lobbying by or the influence of Indian communities on municipal policy” (Mercurol 2017: 444). Relationships between shopkeepers and informal traders are troubled, but informal traders still operate on the walkways in Oginga Odinga Street. 12The situation is different with the informal selling places surrounding Jomo Kenyatta Sports Ground because most of the traders settled at the side of the park, a formerly unoccupied public space. 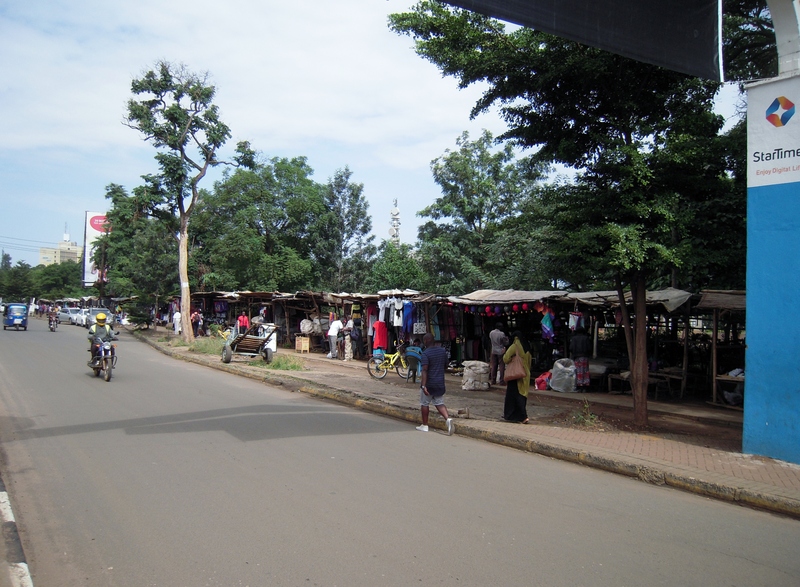 Ojino Okew Street and Jomo Kenyatta Road have stalls – kibanda – made of wood with a sheet metal or canvas cover generally of 3-6m² (picture 1). 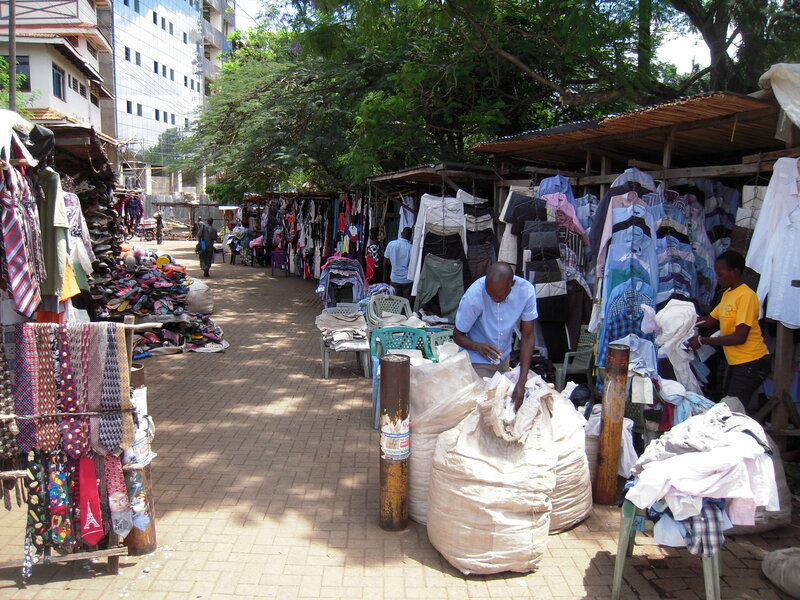 Ojino Okew is a pedestrian street that looks like a linear market or the street of a souk (picture 2) On the other side of the kibandas of Jomo Kenyatta Road, the traders have more basic facilities often consisting of a simple tarpaulin on which their meagre stock is spread out. In Ang’awa Street, the selling points are very basic with the most elaborate involving tables or ingenious hanging rails. 13The majority of the products on sale are second-hand clothes followed by new clothes, metallic household goods, small electronic goods and various small objects. Not all these types of products are found on every street. Certain sectors specialize in certain products, for example, metallic household goods are concentrated in a section of Otieno Oyoo Street. Specialization is an advantage for commercial attractiveness. There are two other cases of commercial specialization in a section of Jomo Kenyatta Road. On each working day at around 5 p.m., about a hundred (mostly female) vendors come onto the pavement to sell fresh food and second-hand clothes to CBD workers on their way to the Bus Park (picture 3). Evening street trading is the only access they have for a selling place as they have not been able to find available selling spaces during the day. Opposite them, there are around 40 identical white books kiosks that are the result of a formalization operation in 2009 targeting a small portion of the street traders. For a few hours then on each working day, the most precarious form of trade and a model of the formalisation of street trade coexist in the same place. These combinations show that formalization operations integrate a minority of street traders, while the majority of street traders remain in areas undesignated for trade and in an ambiguous institutional environment as shown in the next section. 14The legitimacy of the rules governing the streets of Kisumu is plural; different actors refer to different registers to back up their discourse and practices. The local authorities consider that any trade activities carried out in a space not designated for such usage is informal; “they are informal in the sense that they operate at a non-designated point” (interview with Kisumu senior city planner, April 15, 2016). Yet, Kisumu’s town planning seems outdated given that the last document on the subject setting out the conditions for attribution and usage of ground space was developed in 1984. Further, there is wide consensus that “Kisumu has operated without regulation and plans” (interview with Kisumu senior city planner, April 15, 2016) and that “the four decades of growth have been mostly informal” (Nodalis et al. 2013: 167). However, in 2002, Kisumu, with UN-Habitat support, equipped itself with a City Development Strategy (UN-Habitat 2004). Although this inspired the Kisumu authorities in their new approach to urban development (Onyango and Obera 2015), no official planning document and strategy for the attribution and usage of ground space was derived from this. Further, the legitimacy of the local authorities’ definition of informal commerce is questionable because the officially designated areas were defined decades ago and the authorities back their arguments by referring to even older documents such as the General Nuisances Bylaws of 1954. These by-laws date back to the colonial era and define all sorts of informal trading such as “begging” (Mercurol 2012). In general, by-laws “allow city inspectorate officers to arrest anyone deemed to be creating ‘general nuisance’ in public spaces” (Hendrix 2010: 152). 15The Kisumu authorities issue a single one-year licence business permit to registered business entities but street traders cannot apply for such a licence because their business operates mostly in undesignated areas for trade and because they do not have a physical address, i.e., a permanent structure or a kiosk. In such conditions, their activity is still considered as temporary and uncertain. “They [local authorities] use the word temporary over decades [ ] anytime if they feel like, they come with bulldozers” (interview with Anne, a street trader in Jomo Kenyatta Road, December 16, 2016). Yet, street traders pay every day a daily market fee of 30 shillings to Kisumu city authorities. This shows that street traders do not operate outside state regulation, but the authorities still consider the street traders informal: because of the discrepancy between the current usage of space and how it is attributed in the old by-laws; and because the current conditions to apply for an annual license cannot be fulfilled by the street traders. In Kisumu, the legal environment is therefore a driver for maintaining street trade in informality. 16The lack of formal recognition of street trading at the local level contradicts national law, namely the Micro and Small Enterprise Act from 2012 and the Urban Areas and Cities Act from 2012. The first Act defines a “‘company’ as an undertaking or a business concern whether formal or informal engaged in the production of goods or provision of services” (National Council for Law Reporting 2012a: 7), whilst the Urban Areas and Cities Act states that integrated urban development should “nurture and promote development of informal commercial activities in an orderly and sustainable manner” (National Council for Law Reporting 2012b: 18). Neither of these two documents refers to the term “informal” as economic activity punishable by law. 17The daily regulation of street trade derives its ambiguity from the contradictions of the national political and legislative frameworks and local policies. This situation of being caught between two stools can also be observed in Nairobi. It serves to keep street trade in a state of precariousness and opens the door to all sorts of abuses such as the quasi-daily corruption of officers (askari) in charge of enforcing by-laws (Lyons and Snoxell 2005, Mitullah 2005, Schlegel and Racaud 2016). In Kisumu, John has been a street trader since the 1990s and has had numerous problems with the authorities. He has paid an incalculable number of fines ranging from 3,000 to 9,000 shillings each: 3,000 for obstructing movement along the streets, 3,000 for lack of a licence and 3,000 for resisting arrest. George has had his stock confiscated several times. Indeed, it occurred three times in 2003 during the repressive period when the street traders were struggling to obtain places in the CBD after Bus Park renovation (interviews with John and George, June 8, 2016). 18The repressive discourse towards street traders is based on arguments regarding hygiene, public safety and modernization (Lindell 2010), which have their roots in colonial urban policy (Morange 2013). Indeed, in recent town planning documents such as the City Development Strategy of Kisumu, informal activities are presented as undesirable in the CBD for the usual range of reasons linked to hygiene and safety, which date back to colonial days (Mercurol 2012). On other occasions, informal trade has been accused of hampering the town’s development. For example, following the destruction of Oile market, the City Manager actually justified the operation saying that “[w]e had no option because the city must be developed” (Alal 2014). This approach promotes an identity for the city of Kisumu based on a form of modernity arising from the colonial era and reproduced by local and international development agencies like the Swedish International Development Cooperation Agency, the French Agency for Development, and UN-Habitat, to name but a few (Mercurol 2017). Moreover, city authorities use arguments that street trade is a form of unfair competition with formal traders to justify their repressive policies applied to street traders. In Kisumu, both the general discourse and state-based practices at the local level are based on a highly negative representation of street trade. This representation is observed in other countries in the Global South (Chen et al. 2016). 19Authorities often consider street traders to be disorganised. Yet, this contradicts reality. Indeed, street traders are often well organised, for example, in self-help groups. In Kenya, the movement of self-help groups has a long history. Is originated from community development related to rural women and has progressively gained legal status. The Public Benefit Organisations (PBO) Act of 2013 recognized self-help groups as Civil Society Organisations (CSOs). The Kenyan Constitution, Bill of Rights and Kenya Vision 2030 encourage self-help groups as they are an instrument to access government funding for investment in social welfare and empowerment. These associations are registered with the Ministry of Gender, Children and Social Development. This status requires such groups to have weekly meetings, regular elections and to keep registers, among others, while offering services such as capital accumulation through savings, loans and providing social aid, e.g. in assisting members financially who have suffered a bereavement. These self-help groups consist of between five and 50 members. For example, in 2016, the Upper Ojino Okew Self Help Group had 52 members. The chairman, secretary and treasurer are elected, and each member contributes at least 150 shillings per week (100 shillings for saving, 50 shillings for welfare). These groups are also a way of obtaining a stronger political voice as “the group connects you to authority, and it protects you” (focus group discussion, April 21, 2016). In other words, these groups negotiate protection and resources to political leaders through clientelism (Mercurol 2017). In Kisumu’s street trade circles, there are said to be around 40 such groups (interviews with George and Mike, street vendor leaders, April 20 and June 7, 2016). This is yet another paradox: a large number of those involved in these activities are considered informal, whereas they organize these activities within a formal legal framework. 20Overall, the institutional framework is characterised by contradictions that restricts street traders in a precarious situation. The ambiguity of the regulatory framework leans on the concept of “informality” which is used against street traders’ interests. The above examples show that “informality” is an ambivalent political and social construction. In addition, they reveal that there is a confrontation of legitimacies between street traders and local authorities. The next section demonstrates that the ambiguous regulation of informal trading streets contributes to room for conflicts. 21The struggle for trading places can be interpreted through its daily regulation. For decades, street trade has been a major alternative responding to the inability of the formal employment market to provide sufficient working opportunities. “This is where we report immediately after school” as Irene, a street trader working since the 1990s, pointed out. She indicated that until the end of the 2000s, it was possible to find a good trading spot but the streets have been filled up since then (interview with Irene, June 9, 2016). Ben, a street trader selling in Ang’awa Street since 2006, confirmed this: “At that time , it was very easy, there was nobody here. But now it’s very difficult to get a place” (interview with Ben, April 13, 2016). This increases competition and has a negative effect on business: “now, business is going to be bad” (interview Ben, April 13, 2016). The demand for trading places has created an “informal” land market involving a class of street traders who are also “discreet owners” and assert that their long service as traders makes their ownership legitimate. The rush towards available and ideally placed CBD streets such as Ojino Okew back street and Jomo Kenyatta Road has led to land speculation. The longest standing traders in Oginga Odinga Street took over trading places in these two streets. In Ojino Okew back Street, it is possible that a trader who has set up just one stall can go on to rent out up to five other stalls. The first occupants often appropriated a space several metres long, which they then split up. Monthly rents for a two-metre-long space can cost up to 2,000 shillings. Certain stalls may belong to someone who does not even sell in the street concerned. Even if a place is unoccupied, it is still someone’s property and installation thereon is regulated by an informal property system, which the street traders recognise. It is not possible to set up a stall without the street traders’ community being certain that there is a prior agreement with the stall owner. Sale of trading places are possible, but “you must acquire these places from somebody” (interview with George, April 20, 2016). A female trader who has had a place at the junction Oginga Odinga Street / New Station Road since the 1980s only possesses a small bamboo table to indicate her presence as a trader (picture 4). However, she considers that this portion of pavement under an electrical relay belongs to her and that she will rent it out when she no longer has the strength to sell there as a kind of retirement insurance: ”this place remains mine when I get too old” (interview with Edith, April 13, 2016). This kind of “informal” ownership therefore has no legal status but is considered legitimate by tenants, purchasers and owners. Nonetheless, this status is precarious because any conflict between private actors cannot be solved by the courts. John found this out at his own cost when his brother sold his trading place on Jomo Kenyatta Road for 80,000 shillings (around 700 euros). Moreover, the notion of property becomes ambiguous when a tenant invests in the construction of a wooden stand on a place which s/he does not own and which has no legal status. The ambiguity of the informal trading places lies in the use of places which are recognized by the attribution of a daily market fee, but which have no legal trading status and conversely in property appropriation as recognized by the street traders’ community. 22In Kisumu, since the 2000s, urban development projects have introduced an inclusive and participative dimension through boards but these have led to the exclusion of street traders. Co-managed projects in Kisumu have been more ways and indicators of conflicts than consensual management tools for the informal sector (Mercurol 2017). For instance, in 2016, a project spearheaded by Kisumu County authorities planned to replace the wooden structures around Jomo Kenyatta Sports Ground with new kiosks. The project set up committees which were presented as being inclusive. However, the way in which the participative committee was set up revealed both inclusion and exclusion processes. Faithful supporters were invited to meetings while dissidents quickly stopped being invited. Instead, they were removed from the meeting’s participants’ lists because there were not supposed to be discordant voices on the committee. For instance, George, who leads a group of about 50 street vendors located in the project area, was invited to the first meeting only (interview with George, December 16, 2016). John, an emblematic leader of street vendors trading around Jomo Kenyatta Sports Ground since the eviction of Oile market, has not been involved in the participative discussion about the kiosks’ project (interview with John, December 16, 2016). During discussions prior to the project, the voice of the street traders appears consensual although behind the scenes, the participative process is managed to exclude conflicting points of view. 23The choice of project beneficiaries has also been affected by issues of inclusion and exclusion. For example, the project around Jomo Kenyatta Sports Ground firstly consisted of listing the “owners” of the selling places before the attribution of the kiosks. This process failed as street traders refused to provide such information/lists. Indeed, several street traders own several informal selling places although, in general, a street trader is perceived as a small-scale entrepreneur working at one single selling place and not as an owner living off rental income. Yet, many street traders rent their selling place to an owner who does not want to catch the authorities’ attention about the informal land ownership. The informal street trading land market prevents the implementation of improved street trading places based on the identification of individual beneficiaries. There is a gap between the norms of the street trading management by the authorities and the norms of the street traders. 24In addition, the attribution of new selling places is opaque and often perceived as unfair. Interviews with street traders and with street traders’ representatives committed in projects related to informal trading reveal that those involved in the negotiations on the sides of the street traders and the authorities attribute several kiosks to themselves. The renovation of the Bus Park funded by the World Bank in 2003 is a textbook case of an inclusion/exclusion process. For the Bus Park renovation project, the street traders’ representatives had to provide a list of beneficiaries who were actually members of the market community. However, some representatives of the informal traders as well as officials involved in the negotiations included members of their family as strawmen at the possible expense of traders, and they therefore got some more kiosks. Problems of leadership and corruption are common as Edmond, a street vendor leader involved in the Bus Park project, claims: “You will not avoid being corrupted”, and “nobody will do it free and fair” (interview June 9, 2016). In addition, some beneficiaries of the kiosks rented them out and settled on streets like Ojino Okew. This model of informal trading management partially integrates a minority of street traders in improvement areas while the majority of street traders are relegated to areas without improved facilities (Pezzano 2016). On the occasion of these projects’ implementation conflicting interests in informal trading places converge for the benefit of actors involved in the negotiations. On the one hand, support from street vendors’ leaders gives legitimacy to the authorities’ project, while, on the other hand, the attribution of several kiosks to street traders’ representatives ensures their loyalty to the project promoters. 25The governance tools, from which these projects are derived, are ambiguous. They represent a true godsend for committee members because often, from one project to another, there are few changes in the composition of the committees. In Kisumu, a project committee bases its work and methods on those of the previous project committee (Onyango 2015). Committee members have access to important information and the power to agree on the allocation of kiosks and to appropriate some. Getting a place on a committee has become of significant importance in the competition for power as it enables the holder to strengthen its clientele, which would then benefit from redistribution by the leader. Committee membership can further provide guaranteed income through the illicit rents and, in terms of power, through clientelism. Taking over improved selling places is an important source of income, given, for example, that the average rent of a kiosk at the Bus Park is 8,000 shillings, which is three quarters of the legal monthly minimum wage. Certain street traders’ representatives have direct connections to senior political officers and to representatives on several administration levels ranging from the local council to the governor and the minister. The size of a leader’s address book defines their political importance. Hence, social, political and economic opportunities can derive from good connections to sources of power. Meagher (2011) notes that relations between the informal sectors and the state are ambivalent. They maintain forms of political incorporation based on clientelism as shown in the case in Kisumu about the reallocation process or formalization operations as mentioned above. 26Certain personalities have become quasi-champions of street trade representation even though this sector is highly fragmented with around 40 registered groups with their own leaders. The position held in the social field by Mike, the street traders’ charismatic leader, provides him with a place immaterial of ground space or the street because, paradoxically, he does not directly trade himself. He is now familiar with the opulent offices of politicians and financial backers or the rather more austere offices of academics. The most emblematic leaders like Mike won their spurs during past struggles. The denunciation of daily harassment by the city askari municipal agents in charge of making traders comply with the law was the starting point for him. “I started my leadership in Oginga Odinga Street because there was a lot of harassment”, Mike said about how he began as a leader in the 1990s (interview June 7, 2016). Having a common enemy, in this case the local authorities, created both a form of class solidarity for the small-scale precarious entrepreneurs and also a class of leaders. However, the opacity of the participatory process favours a process of exclusion and divergences between the interests of leaders and the interests of members on the ground. 27The connections with political power are accessible for those positioned in the “right” places and the latter are therefore a source of competition. The struggle for places concerns a “whole group of relations between the position of the individual in a social field [ ] and the place s/he is likely to occupy in the materiel space” (Lussault 2007: 32). The inclusion/exclusion process mentioned above is an outcome of the competition for the “best places”. The best places are key positions located by the board for informal trading management that comprises of street traders’ representatives and political authorities. They enable actors, particularly the brokers acting as mediators between street traders and authorities, to secure a guaranteed income. The best places are also visible in the streets because it is more profitable to occupy a sheltered trading space from morning to night in a very busy street than being relegated to the end of an alley with only a cardboard box as a display unit. 28This section showed that rivalries of power for the access and the control of the informal street trading places increase from the daily regulation to the occasional modern kiosks projects. The street, as a resource, enters in the production of both economic and political value that change according to the institutional environment and the projects’ programme. With the streets becoming the object of a development project, they attract increasingly more interest and more actors. Consequently, their value rises. Conflicts are the concern of individual relations for the daily regulation, but they are a concern of collective logics in the case of projects related to informal street trading management. The confusion between personal interests and collective interests contributes to processes that exclude members whose points of view differ from the ones of their representatives. The opacity of the governance in a context of an ambiguous institutional framework gives room for political manipulation and clientelism relations. In sum, the collective governance of informal street trading has resulted in the fragmentation of the street traders’ class. 29This article investigated the access to and control of the informal trading streets around the Jomo Kenyatta Sports Ground. It showed that the ambiguous institutional framework gives room for conflicts and for guaranteed income for some actors acting as mediators between street traders and authorities. The development of an informal trading street results from informal traders’ strategies to find selling places close to customer flows and from the ambivalence of Kisumu public policies towards informal street trading. Indeed, the renovation of the Bus Park in 2003 and the eviction of Oile market in 2014 brought about the transfer of informal traders to Kisumu CBD. It illustrated how public policies contributed to the development of “informality”. The private appropriation of public spaces near places of political power symbolises the ambiguity and contradictions that are elements of the relation between formality and informality. 30In addition, Kisumu authorities’ regulations fluctuate between tolerance and violent repression. This illustrates the legal and political contradictions between the local and the national scales and the opacity of informal street trading management at the local level. This causes ambiguous institutions with regards to informal street trading regulation and the ambiguities are a political construction such as the term “informality”. In a context of the growing scarcity of places and increased numbers of street traders, competition for selling places is fierce. Consequently, the rivalries of power towards street regulation increases and as with any resource, the economic and political value of the informal trading streets rises. This is particularly the case when the local authorities plan a project. The lack of clarity of the regulation process, especially in regard to the hidden land market, gives room for manoeuvre by actors located at the interface between traders and authorities. Street traders’ leaders and chairpersons of groups, fusing collective and personal interests, interact with the political authorities often through clientele-based relationships, which empower these new brokers and guarantee regular income at the interface of economic, social and political advantages. 31The governance of contested spaces and public policies are characterised by inclusion and exclusion processes as the paper shows through the kiosks project around the Jomo Kenyatta Sports Ground. The illustrated fierce competition for selling places links competition for the best places with activities in the political arena. The resulting fragmentation of the street traders’ sphere, fuelled by clientele relationships, undermines collective action, popular empowerment and civil order (cf. Meagher 2011). The modes of access to and control of the informal trading spaces around the Jomo Kenyatta Sports Ground show the conflict inherent in the production of space. They also notably highlight the contradictions between the “conceived space” referred to by urbanists (Lefebvre 1974), and the “living space” occupied by users (Lefebvre 1974) like the street traders. “Not only have the actors of informality taken possession of the downtown space, they have also totally transformed the nature of public space” (Steyn, 2012: 180) as an appropriated resource. 32The example of the contested “informal” trading streets in Kisumu illustrates the gap between the globalised norms of modernity and development on one side, and the norms rooted in the social, economic and political contexts on the other. For the street traders, the living space means that the streets they appropriate are a resource, from which they derive economic opportunities. However, the conceived space means a street as a public space, that is, a street including several urban services such as traffic flow and access to buildings in the city; a street likely to improve the attractiveness of the centre and the image of the city. In sum, “informal” trading streets are a showcase of the confrontation between two legitimacies: that of the poor rooted in the local context, and that of project promoters of a globalised urban modernity. Alal M. 2014. Kisumu traders protest. The Star, September 15, https://www.the-star.co.ke/news/2014/09/15/kisumu-traders-protest_c1003841 (Retrieved November 21, 2018). Benjamin N, Beegle K, Recanatini F, Santini M. 2014. Informal economy and the World Bank. Policy Research Working Paper 6888. Washington, The World Bank. Berrou J-P. 2014. Entrepreneurs du secteur informel, in Chauvin P-M, Grossetti M, Zalio P‑P (eds.) Dictionnaire Sociologique de l’Entrepreneuriat. Paris, Presses de Sciences Po: 227-243. Blundo G. 2002. Editorial. La gouvernance, entre technique de gouvernement et outil d’exploitation empirique. Bulletin de l’APAD 23-24, https://apad.revues.org/129 (Retrieved July 20, 2018). Bourmaud D. 1988. Histoire Politique du Kenya. Etat et Pouvoir Local. Paris, Karthala. Brown A, Lyons M. 2010. Seen but not heard: urban voices and citizenship for street traders, in Lindell I (ed.) African Informal Workers. Collective Agency and Transnational Organizing in Urban Africa. London, Zed Books: 33-46. Charmes J. 2012. The informal economy worldwide: trends and characteristics. Margin: The Journal of Applied Economic Research 6(2): 103: 132. Hendrix B. 2010. Urban livelihoods, institutions and inclusive governance in Nairobi: ‘spaces’ and their impacts on quality of life, influence and political rights. Amsterdam, Amsterdam Institute for Social Science Research, unpublished PhD diss. Kenya National Bureau of Statistics. 2015. Statistical Abstract 2015. Nairobi, Kenya National Bureau of Statistics. Kenya National Bureau of Statistics. 2017. Economic Survey 2017. Nairobi, Kenya National Bureau of Statistics. Lacoste Y. 2012. La géographie, la géopolitique et le raisonnement géographique. Hérodote 146-147: 14-44. Lavigne Delville P. 2002. Le foncier et la gestion des ressources naturelles, in Memento de l'Agronome. Montpellier, Centre de Recherche Agronomique pour le Développement, Groupe de Recherche et d’Echanges Technologiques, and Paris, Ministère des Affaires Etrangères: 201-221. Lefebvre H. 1974. La Production de l’Espace. Paris, Anthropos. Lindell I (ed.) 2010. African Informal Workers. Collective Agency and Transnational Organizing in Urban Africa. London, Zed Books. Lussault M. 2007. L’Homme Spatial. Paris, Seuil. Lyons M, Snoxell S. 2005. Creating urban social capital: some evidence from informal traders in Nairobi. Urban Studies 42(7): 1073-1092. Martignon V. 2003. Les lûkanda de Sanaa. Structures urbaines d’intégration sociale pour les travailleurs migrants? Chroniques Yéménites. doi: 10.4000/cy.162. Martin J-Y. 2006. Une géographie critique de l’espace du quotidien. L’actualité mondialisée de la pensée spatiale d’Henri Lefebvre. Articulo Journal of Urban Research (2), http://articulo.revues.org/897 (Retrieved July 21, 2018). Meagher K. 2010. Identity Economics: Social Networks and the Informal Economy in Nigeria. Suffolk, James Currey. Meagher K. 2011. Informal economies and urban governance in Nigeria: popular empowerment or political exclusion. African Studies Review 54(2): 47-72. Mercurol Q. 2012. La refonte de la hiérarchie scalaire et la construction conflictuelle d’une échelle métropolitaine de gouvernance à Kisumu, Kenya. Paper presented at the Governing the metropolis Conference, Paris, 28 November. Mercurol Q. 2017. Kisumu en ses échelles: Les conditions spatiales, temporelles et politiques des ambitions compétitives d'une ville secondaire kényane. Nanterre, University of Paris Nanterre, unpublished PhD diss. Mitullah W. 2005. Enterprise: street trade in Kenya: the contribution of research in policy dialogue and response, in Nabeel H (ed.) Urban Futures: Economic Growth and Poverty Reduction. London, ITDG: 175-188. Morange M. 2013. Street trade, neoliberalisation and the control of space: Nairobi’s Central Business District in the era of entrepreneurial urbanism. Journal of Eastern African Studies 9(2): 247 - 269. National Council for Law Reporting. 2012a. Micro and Small Enterprise Act. Nairobi, NCLR. National Council for Law Reporting. 2012b. Urban and Cities Act. Nairobi, NCLR. Nodalis, Kisumu County, French Agency for Development. 2013. Kisumu Integrated Strategic Urban Development Plan. Paris, Nodalis. Omenya GO. 2015. A global history of Asian’s presence in Kisumu district of Kenya’s Nyanza province. Les Cahiers d’Afrique de l’Est 51: 179-207. Onyango GM, Obera BO. 2015. Tracing Kisumu’s path in the co-production of knowledge for urban development, in Polk M (ed.) Co-producing Knowledge for Sustainable Cities: Joining Forces for Change. London, Routledge: 70-98. Onyango JO, Olima WLA, Onyango L. 2012. Dynamics of street vending phenomenon in the Kisumu Municipality, Kenya. International Journal of Arts and Commerce 1(4): 107-120. Pezzano A. 2016. ‘Integration’ or ‘selective incorporation’? The modes of governance in informal trading policy in the inner city of Johannesburg. The Journal of Development Studies 52(4): 498-513. Portes A, Castells M, Benton LA. 1989. The Informal Economy. Studies in Advanced and Less Developed Countries. Baltimore, The Johns Hopkins University Press. Potts D. 2008. The urban informal sector in sub-Saharan Africa: from bad to good (and back again?). Development Southern Africa 25(2):151-156. Racaud S. 2015. Chasing after a pair of Chinese sandals in Cameroon: actors and places of Chinese junks on commercial roads. Articulo, Journal of Urban Research 12. https://articulo.revues.org/2899 (Retrieved July 20, 2018). Redon M, Magrin G, Chauvin E, Perier-Bruslé L. 2015. Ressources Mondialisées, Essais de Géographie Politique. Paris, Publication de la Sorbonne. Retaillé D. 2011. Du paradigme sahélien du lieu à l’espace (mondial) mobile. L’Information Géographique 75: 71-85. Roever S, Skinner C. 2016. Street vendors and cities. Environment and Urbanisation 28(2): 359-374. Scharrer T, Carrier N. 2017. Giving informality room. Somali entrepreneurs in Kenya have transformed the informal retail economy in substantive ways, in Tavengwa T, Newhouse L (eds.) The Corridor. How the East African Corridor Spanning the Indian Ocean from Somalia to South Africa is Being Radically Re-shaped. Nijmegen, MPI for the Study of Religious and Ethnic Diversity: 34-36. Schlegel P, Racaud S. 2016. Urbanization and Street Vending. Nairobi, Institut Français de Recherche en Afrique. Skinner C. 2008. Street trading in Africa: an overview. WIEGO Working Papers 5. Cambridge, Women in Informal Employment: Globalizing and Organizing (WIEGO). Steyn G. 2012. Modernity and informality, conflicting forces shaping urban form in Kisumu, Kenya. International Journal for Housing Science 36(3): 170-179. UN-Habitat. 2004. Kisumu City Development Strategy (2004-2009). Nairobi, UN-Habitat.